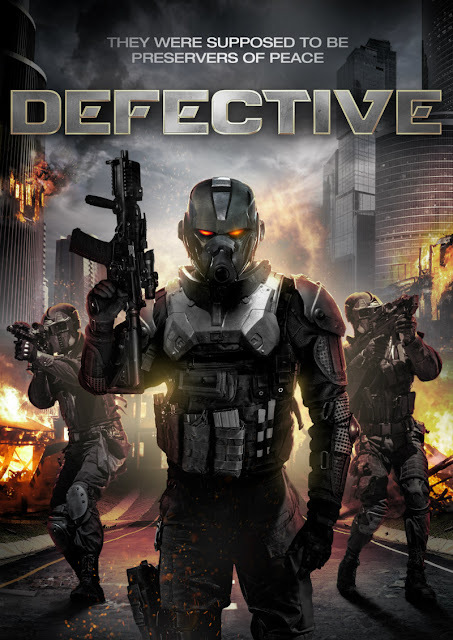 From writer-director Reese Eveneshen, director of Dead Genesis, and genre specialist Uncork’d Entertainment comes the highly-anticipated Defective, premiering on VOD February 13th. In the near future, the corporation S.E.A., has implemented North America’s first and only police state. Uniformed, anonymous Preservers of Peace investigate, judge, and sentence people for even the smallest of crimes. The punishment? Instant public execution. Rhett Murphy and his sister Jean must escape certain execution after witnessing the dark secrets of the nefarious corporation. Colin Paradine, Raven Cousens, and Ashley Armstrong star in a Reese Eveneshen film, available February 13th on VOD from Uncork’d Entertainment. What a great movie. Is this what you think the future might be like? Thank you for the kind words! Well I hope a possible future doesn’t go as far as it does in this movie. However I think a version of that future is certainly here in some respect. Depending on where you travel in the world, you’ll be quick to find an armed guard standing with an assault rifle patrolling the area. We’ve got drones flying in the sky delivering packages… in some places they’re picking people off from miles away. I have yet to see a bonafide police state in North America, but who knows! We’re living in an interesting time, every day seems like a new adventure trying to guess what kind of news you’re going to wake up to. Did you do any research into similar technology? I imagine some of these robot cops aren’t too far away!? The initial design for the Preservers of Peace was based on Taiwanese Death Squads. They’re a paramilitary unit covered head to toe in combat gear for extreme circumstances. We pushed that a little further and mechanised our soldiers in suits. We pushed the robot look a lot more to really try to remove any human aspects from the people who are supposed to be in the suit. They’re meant to come off as anonymous; if you’re in that world you’re never sure of who is in one of the suits at any given time. Funny enough, shortly after we wrapped up filming, we saw that they were going into mass production with these heavy duty urban pacification suits! And these suits definitely bare a resemblance to the idea that we were pushing for in the movie. Did the script start with the character or the storyline? The script started with the storyline. I had been writing another script at the time and it wasn’t working out. I got to a certain point in the script and decided to do a 180 with it by setting it within a police state. It felt right given the scenario. Next thing I knew I was re-writing the script from top to bottom with the story that you see in the finished film. The characters evolved out of that world. I wanted each of them to have a different perspective on the state of their surroundings. One person believes in the new state order, one is indifferent, one is vehemently opposed to it, one works for the state. Then I wanted those different perspectives to play off of each other while the madness unfolded! Kind of the classic pot boiler scenario. The core story that stayed from that first non sci-fi draft was the idea of a Brother and Sister finding each other after years apart. I imagine you toyed with a lot of different looks for the robots? Yes, it took about a year to get to the final look in the movie. The cinematographer on the film (Isaac Elliott-Fisher) is an amazing artist. We would bounce drawings between each other for months, tweaking designs and re-creating whole new ones on the spot. Originally they started off as much more human-like as in the end they are still supposed to be people within the suits. But that still left too much of a personal connection. The robot look spawned out of the indifference that you generally get from robotics. It’s off-putting. Then we started thinking about the ideas of surveillance and incorporating that into their eye designs. Even when the Suits were being built we were still tweaking design elements down to the last minute. We did want to try going with different coloured suits depending on the situation. Unfortunately due to our low budget it just wasn’t an affordable idea. And how were they actually made? A mix of CGI and practical? Those suits are 100% practical. Everything you see with them on screen was done in camera. We really pushed for the man in the suit idea. It’s there, it’s in front of you and it’s real for you and your actors. Pieces were moulded and then cast in foam and plastic. They were then strapped on top of our costume layer with velcro and tape… lots of tape! Tape became our best friend. Those suits look great on camera, but they were constantly falling apart. On day one of shooting the masks started separating and the arm pieces all cracked. We always had a Suit maintenance area set up for emergency repairs, which was often hot glue and tape. It was low budget filmmaking at its finest. We did push for a lot of practical effects though. In the finished film there are 175 VFX shots, but every shot has a practical element in it. The biggest visual effect was our drone, but even with that we had a full size live version on set that we could puppeteer for a handful of shots. What’s your ultimate goal with the film? Kick off a new franchise? No plans for a franchise right now; in my mind it has a pretty definite ending. But we’ll see. The goal with the film was to get it out in the world. And that’s happening this year, which is great. We have our release here in North America before it trickles out to the rest of the world throughout the year. It’s been fun seeing the reactions to the movie and interacting with others who are taking an interest in it. It was a tough shoot; we had to shoot it over a year because we kept having to stop to raise more money! The fact that we finished it and people are able to see it, and the cast and crew have their work being shown… that’s pretty awesome. If a filmmaker is in it ‘for the money’ are they setting themselves up for disappointment? Yes. Do not get into it for the money. If you can manage to make a living at it, then you’re successful. If you manage to get to that top two or three percent who really make it… then great. But this is not a “safe” career choice. It means a lot of sacrifice and odd looks from family and friends. You should be a filmmaker because a life without making movies would be soul crushing. You have to look at a possible future version of yourself who takes a good job with good pay. You may find great wealth and success, but are you going to be happy at the end of the day? I’ve fought with this, I still do. I would be heartbroken if I didn’t work at this. It’s certainly not about the money. Do you juggle your filmmaking career with a day job? Every once in awhile, yes. Bills still have to be paid. There was a five year period before Defective where nothing was happening. We couldn’t get any projects off the ground. Corporate video work wasn’t coming in anymore. It was a dark time. I took a job fixing and installing water heaters. I made good money doing it, but I really disliked it. I think filmmakers are a strange breed of human. We’re stubborn and stupid, we’ll suffer and scrape every cent together to pay bills if it means we don’t ever have to commit to an actual job. If a sequel does come to fruition, what might it be about? Any ideas? I’ve got a couple of ideas kicking around, but that’s about it. Sequels are a tough nut to crack. There has to be an actual reason to make one. And this one was always written as a stand alone movie. However, if I were to make a sequel I’d want it to work independently from the first movie. Without giving away any spoilers, the ending of Defective could definitely lead to an interesting new world. 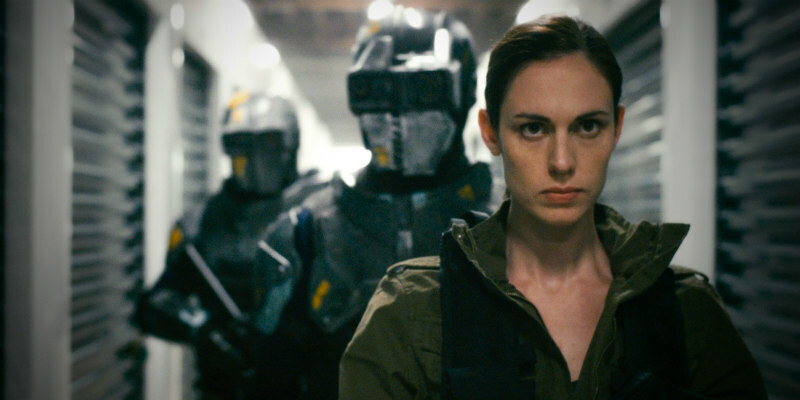 It might be fun to see what kind of police state arises from the actions in the first movie.